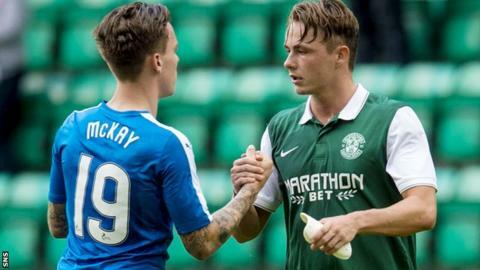 Scott Allan has formally submitted a transfer request to Hibernian in the wake of the club rejecting two transfer bids from Rangers. But Hibs have responded by saying he will not be sold to Rangers. The 23-year-old midfielder had already let the Easter Road club know of his desire to move to Ibrox and has now put that in writing. Rangers have made two offers for the player, with the last offer of £225,000 rejected last week. "In the face of continued media interest, Hibernian Football Club can confirm that Scott Allan has today handed in a written transfer request," said the Edinburgh club. "Hibernian FC has refused both bids because the club has no wish to transfer a valuable player to strengthen a major rival in the battle to win the Championship and gain promotion to the Premiership. "Hibernian's position has not changed. The player will not be sold to Rangers." Allan joined Hibs after being released by West Bromwich Albion last summer. The boyhood Rangers fan featured as a substitute when Hibs were defeated 6-2 by Rangers in the Petrofac Training Cup on Saturday. Speaking afterwards, Hibs manager Alan Stubbs was adamant that the player would not be sold to their rivals.